Did you know that Powers Hall is the fourth oldest building existing on campus and it is connected to some important events of US history? Last semester I took Dr. Fremion’s HST 681 Historical Preservation class, and the final project consisted in writing a mock nomination for the National Register of Historic Places, which lists the historic and archaeological places worth preserving and protecting in the US. After some thinking, I decided to write my mock nomination on Powers Hall. I knew a little bit about its history, also thanks to Jennifer Vannette’s post on this blog, but I wanted to do more research and see if I could find additional information about the building on campus in which I spend most of my time. I can say that my research paid well: I was able to prove that despite few changes, the exterior of Powers Hall retains its overall integrity; it was curious to see how much the interior changed since it was first built; and I found connections between Powers Hall and the broader events of US history, which will be the focus of this post. The first connection is the one between Powers Hall and the New Deal. The works to build Powers Hall – originally Keeler Union – started back in 1938 thanks to a grant from the Public Works Administration. The Public Works Administration was a New Deal government agency active from 1933 to 1939. In those years, President Franklin D. Roosevelt enacted a series of domestic policies to address the continuing disastrous economic and social effects of the Great Depression, which had started in 1929. Among these policies, the Public Works Administration provided funds for the construction of public works. In this way, it provided means of employment and helped to revitalize American’s economy, society, and industry. Therefore, Powers Hall provides a great local example of the far-reaching and significant effects of President Roosevelt’s domestic policy. The years between 1942 and 1944, in which Powers Hall housed Navy V-12 cadets, provides another connection between the building and events of national and international significance. During World War II the United States needed more commissioned officers; therefore, the government created the Navy V-12 program to provide candidates with the education they needed. Central Michigan University, which at that time was known as Central Michigan College of Education, was among the universities that participated to the program. This connects Powers Hall not only with another governmental program but also with World War II and the US participation to it. The ballroom in Powers Hall is still used to host several events and speakers every year; it would not be surprising if you attended one or two as well. Did you know that James (Jesse) Cleveland Owens (1913-1980) was invited to speak there? Jesse Owens was a famous African-American track and field athlete. He is mostly known for winning four Olympic medals at the 1936 Olympic Games in Berlin. He was invited to speak for the 3rd Annual All-Sports Banquet, which took place on May 4, 1955, in the Keeler Union Ballroom. When he attended the Banquet, he also brought with him a 16mm black and white film of the Olympic Games in Berlin to show to the audience. Because of his extraordinary athletic performances, Owens is very well known, and his participation to the Banquet was a great event that linked Powers Hall to the broader national and international sports history. In addition to all these important connections, it is important to remember that Powers Hall is the fourth oldest building still existing on campus. 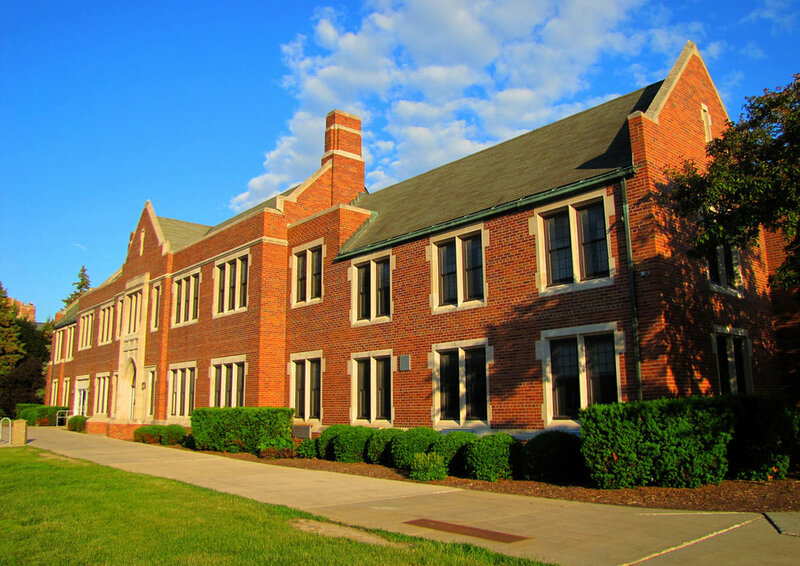 It is in the same block as Grawn Hall, which was opened in 1915; Warriner Hall, which was opened in 1928; and Smith Hall, which was opened in 1934. Since Grawn Hall has gone through significant different expansions and renovations, its architectural integrity is heavily compromised. However, Warriner Hall and Smith Hall retain most of their integrity. Therefore, alongside these two buildings, Powers Hall documents the history of Central Michigan University – our history! – by providing one of the best examples of the first buildings constructed on campus. This year marked the 125th anniversary since the foundation of CMU. If you are curious about the history of the buildings on campus and would like to know more, I recommend browsing the Clarke Historical Library’s website; it has plenty of information on each building. I would also encourage everyone to take a trip to the Clarke. It is always worth seeing in first person all the primary sources they have documenting CMU’s history!